Tracking changes in folders means keeping all the folders open and checking each folder one after another for any newly added files, but this can be really irritating when the folders are huge.Windows has a built in feature for tracking the recently accessed files and folder, but its not possible to track the changes which is tracking the new added files to specific folders.Piles for Windows makes monitoring folders for changes and make available the access to these files from the taskbar. 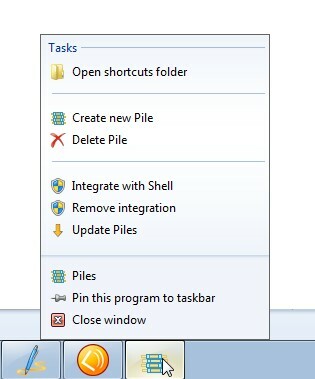 Piles For Windows is similar to Stacks in Mac OS, This app can integrate well with Windows 7 and the Piles ( Stacks) for each folder to be tracked can be Pinned to the taskbar.A Right click on the Piles For Windows Tray icon, shows options similar to what is shown in the image above which has various tasks like Open Shortcuts Folder ( User Created Piles Location ), Create New Pile, Delete Pile.To create a new Pile, Select “ Create New Pile ” From the menu which should open a new “ Create New Pile “ Window, Browse and select the folder you want to track, a name for the Pile and a icon to differentiate from many of Pile ( This is optional ) and finally Press “ Create “ to create a new Pile.Once this is created, the Piles Shortcut window is opened with the Pile Shortcut, Drag and Drop the shortcut to the Windows 7 taskbar and Pin It. 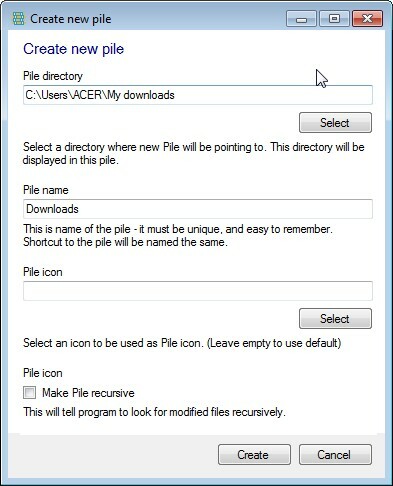 Piles can also be integrated into the Windows Explorer to create Piles for any folder easily.To add Shell integration, Right Click on the Piles tray icon and select “ Integrate with Shell “.The Piles stack can also be updated automatically by selecting the “ Make Pile Recursive “ to make the program look for modified files recursively, instead of the manual lookup for update on user interaction.